There was about an 18 to 24 month time period where we had really rotten sleep. I didn’t blog about it much because, well, who wants to be reminded about how little sleep they’re getting? Besides, it felt like some kind of cosmic payback from Nicole sleeping so well as an infant. I jinxed it. I must pay for it. It started when we moved to Silicon Valley. One of the criteria’s in apartments we were looking for was location. We picked the complex in part to keep the amount of city street driving minimal, and therefore the commute time minimal. My exit was right across the street from our apartment complex. Domingo only had to drive a few blocks down the major through way to get to his highway. Those few blocks could easily add twenty minutes to his commute, so from a time saving perspective I can’t say the location was an entirely poor decision. What we didn’t anticipate was the amount of traffic noise we’d be hearing, punctuated by the not so occasional siren. What I did not know when we signed the lease was that the local hospital was just down that major through way in the opposite direction of Domingo’s exit. Any accident on either highway meant the ambulance would be barely down our street, usually followed by police and sometimes the fire department. And, of course, that took them right past Nicole’s window. Nicole went from being a solid sleeper to waking nightly. We tried white noise machines, but to know avail. Sirens are meant to be heard. In a small apartment, any one person waking up usually meant we’d all be waking up. By the baby was a few months old, she was already out sleeping the toddler. 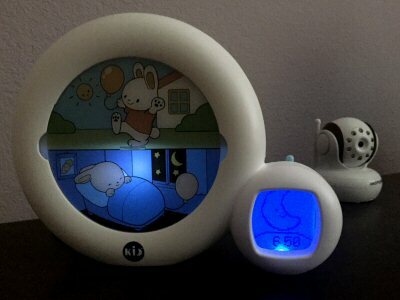 My infant was sleeping through the night far more consistently than my toddler. For . A . Year. We had hoped the quite of suburbia would help Nicole return to her solid sleeping phase, but at that point she was too used to her night time wakings. There were more nights where she’d sleep through the night, but it was nothing like that glorious infant sleep of her first year of life. Back in November a friend recommended an OK to wake clock. 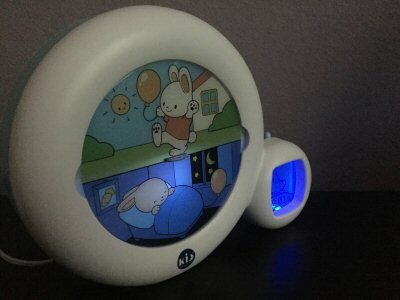 We went with the Kid’Sleep Moon White/Blue Nightlight, her “bunny clock” as she calls it. There were a couple of rough nights, include the early morning insistence that the “bunny was broken” when the bunny didn’t wake up early enough for Nicole. We coupled the bunny with morning prizes (stickers, temporary tattoos, etc) for a night well done. I’m not sure if it was the bunny clock, or the morning prizes, but things finally started turning around for us. 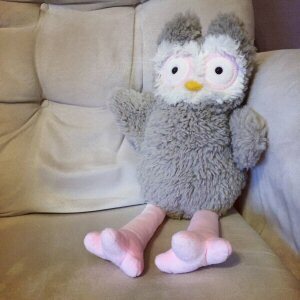 After a week or so we started noticing a significant change in Nicole’s night time sleeping. She rarely woke in the middle of the night, and stayed in bed until the bunny “woke up”. 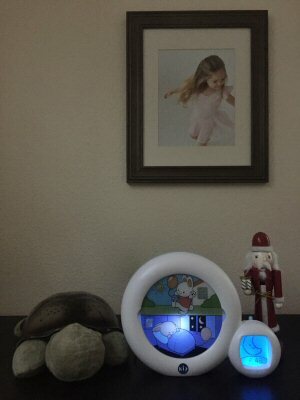 I even caught her on the baby monitor in the middle of the night, sitting up to see if the bunny was awake before settling herself back down. We’ve been three months now without a single middle of the night waking from her. We may still not be getting much sleep. The bunny gets up pretty early. But it’s consistent, uninterrupted sleep and that is such a life changer. Nicki hated being swaddled, but was quite content to be snug as a bug in the rock n play until almost nine months. Given that Alexis was my little cuddle bug and loved being swaddled all the way through four months, I thought she’d practically live in the rock ‘n play. That would be a big, fat Nope. For the past week or so she’s been really struggling at night, thrashing about in the rock ‘n play. She just doesn’t seem to be comfortable in it anymore. Since hitting the four month sleep regression her sleep has gotten steadily worse. She was to the point of waking up every 45-90 minutes for the first couple of hours when she first went to sleep, and then again starting at around 2 am. That, of course, means no sleep for the rest of us. We were hoping to hold off moving her to the crib until we moved. We worry about the girls being practically on top of each other here in the apartment, and keeping each other awake. If we waited until we moved, we could get all our rocky transitions over with in a single shot, rather than stringing them out over a longer time interval. She’d move out of rock n play from the master bedroom at our apartment to a room of her own and her crib in the new house, all at once. At least that was our thinking. Even though we were only a week away from our planned move Alexis (and by transitivity us) was sleeping so little it just seemed like something that couldn’t wait. So off to the crib she went. I went with her. The crib was in the office, and I slept on the couch next to her. I wanted to be able to respond quickly, and sooth her back to sleep before she woke big sister. As expected her first night was rocky. She woke up almost as frequently as she’s been waking up. Last night? So much better. She slept most of the way through the night. No more thrashing. No more frequent wakings. And equally as important, less waking each other up than we feared. Hopefully this means better sleep for everyone. I am now convinced Domingo and I had nothing to do with Nicki’s amazingly awesome newborn sleep. When Alexis was born I made the cardinal second time mom mistake of assuming raising her would be just like raising her big sister. I just assumed she’d have similar sleep patters. By the end of the first week or two, she’d already be sleeping 5 hours straight. Right?? She didn’t. Nor the next week. Nor the next. I didn’t blog enough the first time around to remember all the details of Nicki’s sleep pattern so I kept hoping, but by one month there was no denying that Alexis’ sleep patterns were more typical of someone her age than Nicole’s ever were. I tried everything I could think of trying to find the magic combination that worked for Nicki: swaddled/unswaddled, breastfeeding/bottle feeding before bed, “tanking” her up by encouraging her to eat a little more when she was showing signs of being full. It was a colossal mistake. Rather then make her belly super full it made her bladder super full, and then her diaper super full. The worst nights was when her digestive track was out of sink and shed wake up hungry but sans pee, or with pee but sans hunger. You’d know another wake up wasn’t far behind. A week or so ago it looked like we were in for a second round of day/night reversal. Alexis would wake up after only 90 minutes or so, and take another hour before falling back asleep. This was happening at the same time that Nicole decided to rebel against night time sleep. I’d be rocking Alexis whose eyes were just starting to close and hear Nicole wake up in the monitor. It was a no-win situation. If I’d put Alexis down before she was in a deep sleep in order to tend to Nicole, she’d start crying and wake Nicole back up. If I ignored Nicole, she’d start screaming and wake up Alexis. Domingo and I were taking shifts, as it was the only way we could each get a couple hours of sleep. In theory anyway. It’s hard to sleep through your child crying, even when you know your partner is tending to them and there’s nothing more you can do. Then, out of the blue, something changed this week. She did seven to nine hours three of the past four days, completely on her own. My sanity is once again returning.